In stock 30 pcs. Also available in our walk-in store. A replacement plastic blade cover for the Skrama bush knife. There really is not much more to say about these, buy, buy! Arvostelu mallia: Löytyhän tästä yks paska ominaisuus. Eli ton skraman lämäseen huomaamattaan helposti liian syvään, jolloin pehmeä gummi + joustava tuppimuovi aiheuttaa ihan helvetin tiukan liitoksen, jossa veistä saa tosissaan kiskoa irti. Ei siin mitää, mut tollanen taktinen miekka kun on jumissa, voimaa tarvitaan enemmän kuin tarpeeks, ja näin terävän veitsen kanssa, nakit on vaarassa irroitellessa. Eikä paketti lähde vyöltä sillä helppoudella, jolla veitsen silloin kuuluisi.... noh. Ei hyvä. Nohevampi fiksaa jonkun ratkaisun tähän, itse en ole keksinyt. Tuotekehittelyä, siis. 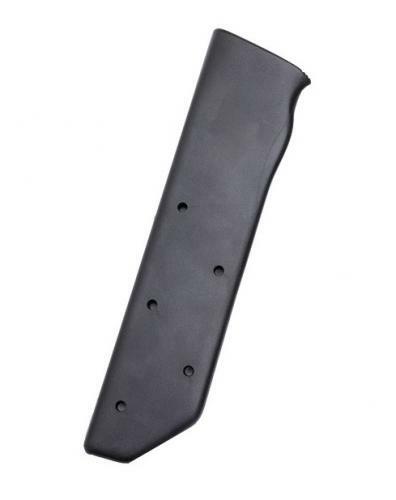 No-frills, hard plastic sheath. Excellent knife storage. Waiting for the Molle sheath to be in stock again. No-nonsense hard sheath that holds the Skrama pretty good. It does fine as a standalone sheath if you don't need to carry the blade on your belt or otherwise slung or attached to a pack, but instead carry it inside a pack, in the boot of a car or just have it hanging on a nail in your workshop. As the protective part inside the leather sheath or the Molle version, it is just excellent. I have the Molle sheath to carry it on a sling, baldric style, and got an extra blade cover for my Skrama for the above reasons - workshop, luggage etc. And just today I found another use. I have a Silky pole saw with a Zubat blade, and due to some extreme abuse, the blade snapped. I ordered a new one and used what was left of the broken blade to fashion a short handsaw (Silky sells the handles separately). So now I have a very sturdy, 20 cm long fixed-blade pruning saw, but no sheath (the real Silky sheath sits, of course, on the pole saw to protect the new blade). I DIY'ed a bit with carboard and duck tape, but then realized that I had the spare Skrama blade protector. And yes, eureka: it fits. The finger guards on the Skrama and the Silky Zubat pruning saw hard rubber handles are so close in size that the Silky is perfectly retained in the Skrama blade protector. I don't know who should be proudest to find that their handle design has characteristics so similar to those of another famous product, but clearly, if good engineers from two sides of the planet design practical tools they end up with similar things. Silky makes a few fixed-bladed saws with blades between 20 and 24 centimeters, and my little experiment indicated that these may well fit fine in a Skrama sheath (the reverse might also be true, opening interesting perspectives). Anyway, I now have a crazy effective short saw and a Skrama sitting in identical sheaths, making a kit that can make short work of any tree branch or trunk up to about the upper-arm diameter of a Varusteleka salesperson, neatly sawn to length and delimbed, to turn it into a stack of firewood or a sturdy fence pole. (If this little story gives you guys and gals the idea to make a Terävä pruning saw to accompany the Skrama, I want one for free... lol ).